In Ontario, the mostly dismal daily performance of wind farms is documented here . While today, March 2, has been a productive day with output running above 80% of generation capability, March 1 figures are truly bleak, with nearby Erie Shores in Port Burwell contributing literally nothing to the power grid for much of the day and climbing to just 30% of its rated capability for a mere two hours. Days like that are more the norm than the exception. The third great lie is that this industry is somehow making a vital contribution to ‘saving the planet’ by cutting our emissions of CO2 – it is not. Read full story here . Tim Hudak and the Ontario PC Caucus will introduce a motion in the Ontario Legislature today calling on the McGuinty Government to restore planning authority to Ontario municipalities so that no industrial wind farm can be imposed on a community that does not want one. Dalton McGuinty’s so-called ‘Green Energy Act’ allows the Toronto based energy bureaucrats at the Ontario Power Authority to arbitrarily place industrial wind farms anywhere in Ontario regardless of the views of the democratically elected local governments. 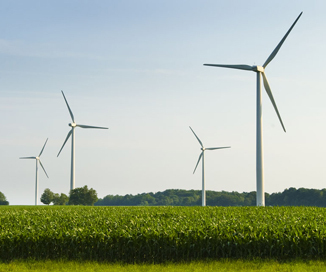 Municipalities across Ontario have expressed economic and environmental concerns about the wind farms that are being forced upon them under Dalton McGuinty’s so-called ‘Green Energy Act’. Ontario PC Leader Tim Hudak is calling on all Liberal Government members to support the motion and give back municipal governments’ ability to decide what is best for their own community. THE first detailed study of Britain’s onshore wind farms suggests some treasured landscapes may have been blighted for only small gains in green energy. Seven hundred offshore wind turbines are being proposed for Lake Erie and Lake St. Clair including 165 turbines north of Lakeshore and wind farms off Amherstburg, Colchester, Kingsville and Leamington. SouthPoint Wind of Leamington had already proposed 15 turbines in three spots off the shores of Kingsville and Leamington. If SouthPoint gets approval for that project, it is proposing a 1,400 megawatt project with 13 wind farms: three in Lake St. Clair and the rest south of Essex County and Chatham-Kent in Lake Erie. Each wind farm could have 55 turbines and could be one to 2.5 kilometres from shore. “Why should we be the guinea pigs?” Leamington Deputy Mayor Rob Schmidt said Wednesday. If it could be the first offshore wind farm anywhere in fresh water, there should be more research done, Schmidt said. There are offshore wind farms proposed on the Great Lakes including Lake Ontario but none approved or constructed in the province.